Irtiqa: Yes, Vatican Observatory does completely normal science! Yes, Vatican Observatory does completely normal science! More than 200 scientists from 26 countries including the United States, Britain, Italy, Germany, Russia, and Japan have gathered in Rome for a five-day meeting on disc galaxies. 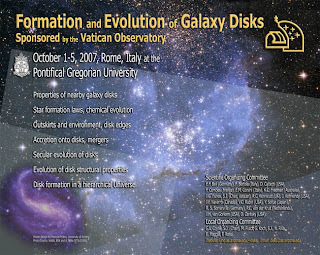 At the Papal University in Rome, normally frequented by Catholic theologians studying the Bible, the scientists, including Jesuit priests who work at the Vatican's own astronomical observatory, will be grappling with abstruse formulae and mathematical simulations about the physical origins of the universe, involving concepts such as cold dark matter and black holes. Why does the Vatican fund astronomical research after centuries of public dispute over the relative roles of science and religion? Hmm...well may be from the fact that many scientists in the past have also been very religious, and that many (not all) didn't see a necessary conflict. Jesuit Brother Guy Consolmagno, a member of Father Funes's team and curator of one of the world's most important collections of meteorites, kept at Castelgandolfo (the Pope's summer residence), explains. "They want the world to know that the Church isn't afraid of science," he said. "This is our way of seeing how God created the universe and they want to make as strong a statement as possible that truth doesn't contradict truth; that if you have faith, then you're never going to be afraid of what science is going to come up with. And then the article goes into the issue of Galileo. And no Galileo case is not a clear-cut science v religion issue. Galileo himself was very religious, and there were many within the Church that supported him. Here is an article that clears up some of the misconceptions: Truth in Science: Proof, Persuasion, and the Galileo Affair (pdf file) by Owen Gingerich. Really?? Has this person even looked at the conference program? Yes, there is dispute about the rates of star formation, or conditions required to sustain star formation in outer-parts of galaxy disks, or the formation of bulges and their relation to disks. But a collision between science & religion?? I have no problem in highlighting the clash between science & religion - and there are many places where that is the case. But this is just plain ridiculous.